An incredible window into the prehistoric past has been opened by the scientific, life-like, reconstruction of the nearly complete remains of an 11-foot long, 67 million year old serpent that was found near a village in Gujarat in western India. A team of paleontologists from all over the world meticulously prepared the fossil. The scientific name tells a story about snake evolution, as unlike modern snakes, this one couldn’t eat large prey because it lacked mobile skull and a wide gape. Depicted above in this sculpture by Tyler Keillor, which was enhanced by original photography by Ximena Erickson and modified by Bonnie Miljour, is a representation of the first and last sight of a newborn dinosaur, unable to defend itself against a giant adversary. 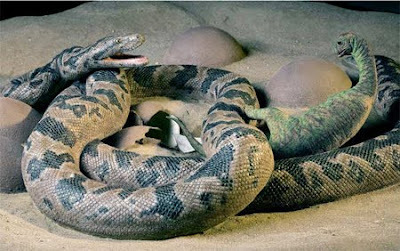 “We think that the hatchling had just exited its egg, and that activity attracted the snake. It was such a thrill to discover such a portentous moment frozen in time,” explained paleontologist, Dhananjay Mohabey, from the Geological Survey of India who first discovered the snake in 1987. The area where the fossilized remains were found contains hundreds of egg clutches and findings suggest that this newly discovered serpent survived by preying upon dinosaur nests and eating the newly-hatched babies. From all suggested evidence, these hatchlings were left by adults to fend for themselves. “It would have been a smorgasbord… Hundreds or thousands of defenseless baby sauropods could have supported an ecosystem of predators during the hatching season, said researcher Jason Head, a paleontologist at the University of Toronto at Mississauga. The discovery of this snake also suggests another theory about dinosaurs that contradicts popular belief of the last century; namely that dinosaurs grew slowly and lived up to 8 decades. “More recent research suggests they actually grew very fast, reaching say three-fourths of adult body size in their teens and living to 30 or 40 years old. After their first year, they might be about 2 meters long (6 feet), too big for this snake to take in,” says paleontologist, Jeff Wilson, from the University of Michigan.